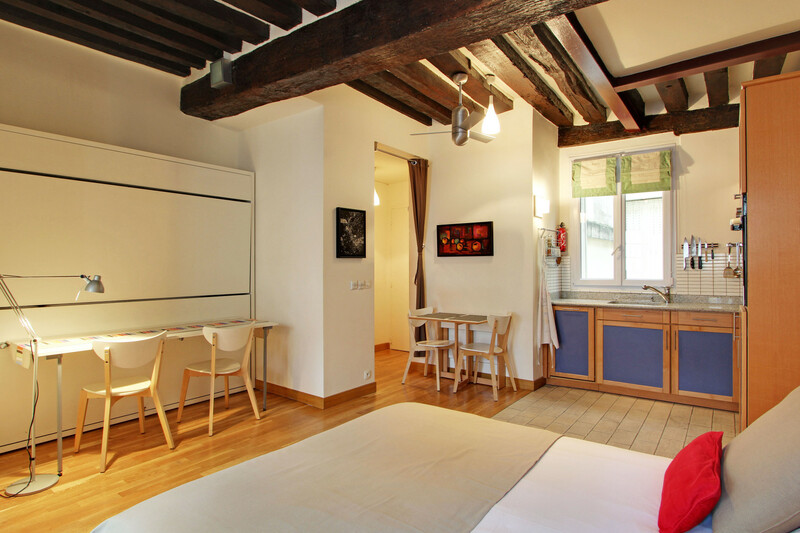 Located in the heart of bustling St. Germain des Prés (the “Latin Quarter”), this newly-renovated studio on Paris’s famous Left Bank is a paradise on the historic rue Dauphine. The rue Dauphine, named in honor of the future Louis XIII, was opened in 1607 following the construction of the Pont Neuf (the "new bridge"). Our studio is on the second story of a well-maintained 18th-century building. One look at a map and you will understand the attraction of staying in our centrally-located apartment. A discrete wood door on the rue Dauphine lets you in the secure vestibule of our building. 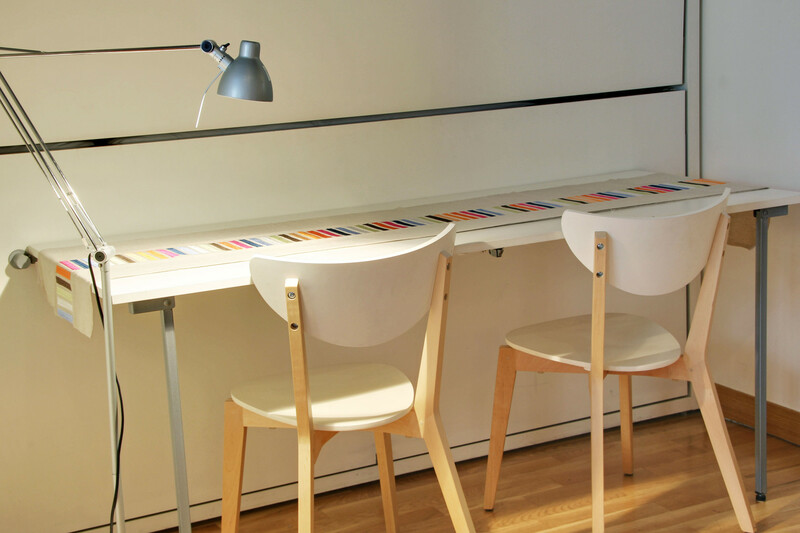 Walk up two flights of stairs (there is no elevator) to our open, airy studio. 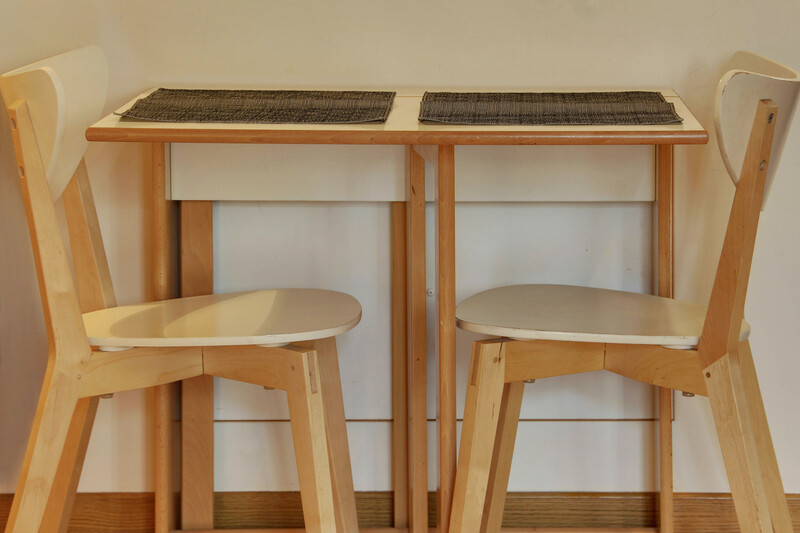 At 45 sq metres (450 sq ft), the apartment comfortably accommodates two adults with one or two children. 11 foot high ceilings with exposed original wood beams, and windows on either side of the apartment, provide great light and a sense of airy spaciousness. The kitchen has granite counter tops, all new appliances (including washer/dryer and dishwasher), and is well equipped for those who like to cook. Cooking in Paris is a delight with the best markets (the Market at St. Germain is a visual and gourmet delight), wine shops, and an American-style grocery stores nearby. Three individual Murphy beds that pull out of the walls are the great surprise in this studio. Don't want to make up your bed in the morning? No problem! Just tuck it away and forget about it. The double bed has a firm mattress and feels comfortable to a 6' tall person. 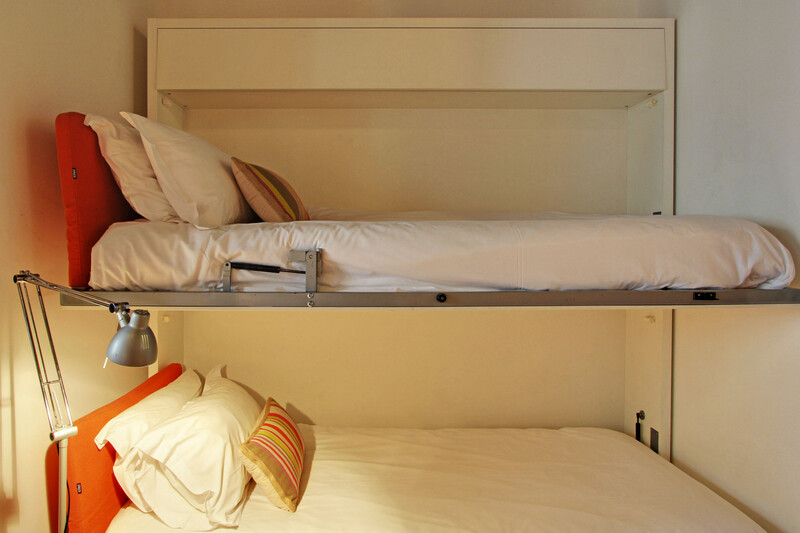 The individual bunk beds also smartly fold up into the opposite wall. From the bottom bed a small table folds out which can be used for work or eating. The new WC is separate from the bathroom. With a 100 litre water tank you will not run short of hot water in the spa-like bathroom which features a heated towel rail, granite counter top, and American-style shower which is high enough to accommodate a tall adult. And yes, even in Paris one needs to relax at home, so the apartment is equipped with WiFi and a flat screen on which to watch cable television. Take one look at a map and you will understand the attraction of staying in our centrally-located apartment. On the second story of a well-maintained 18th-century building. A discrete wood door on the rue Dauphine lets you in the secure vestibule of our building. 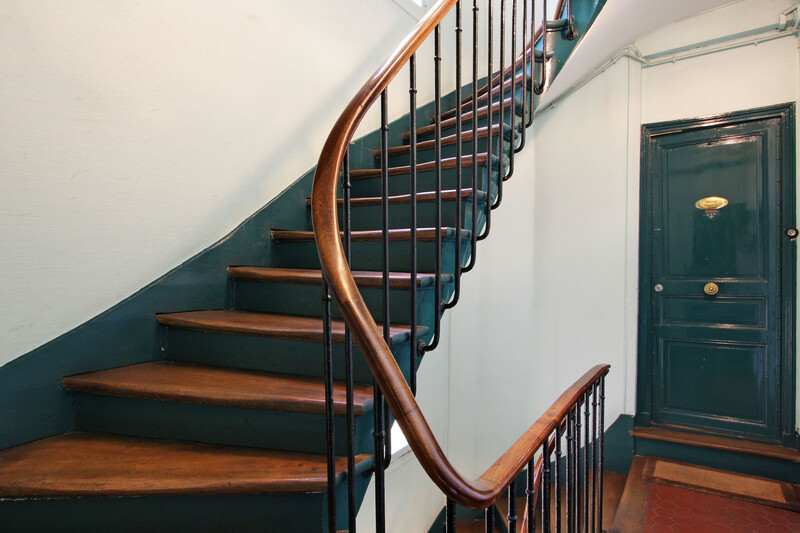 Walk up two flights of stairs (there is no elevator) to our large open studio. The rue Dauphine, named in honor of the future Louis XIII, was opened in 1607 following the construction of the Pont Neuf. Saint-Germain represents the legendary Paris of cafes, jazz clubs, boutiques, bookstores, galleries, and museums. Literary and artistic walks abound in this neighbourhood associated with luminaries including Ernest Hemingway, Gertrude Stein, Jean-Paul Sartre, and Simone de Beauvoir. Rue de Buci is only a block away and has everything from fruit and vegetable stands, gourmet food stores with tantalizing take-away, as well as wine and cheese shops. Eateries abound in this neighbourhood, from intimate bistros to elegantly appointed, Michelin-rated restaurants. A stone's throw away are three favourite haunts of famous writers, the Cafe de Flore, Les Deux Magots, and Brasserie Lipp. Or perhaps you desire bread and pastries from some of the finest patisseries in Paris? Laduree and Paul are right nearby. If you are an art lover the Louvre, the Muse d'Orsay, Notre Dame and Cluny, as well as many other museums are all within a fifteen minute walk. For walking or jogging the Tuileries Garden is located close by and you will never forget the lovely experience of seeing the Louvre and the Tuileries before visiting hours. 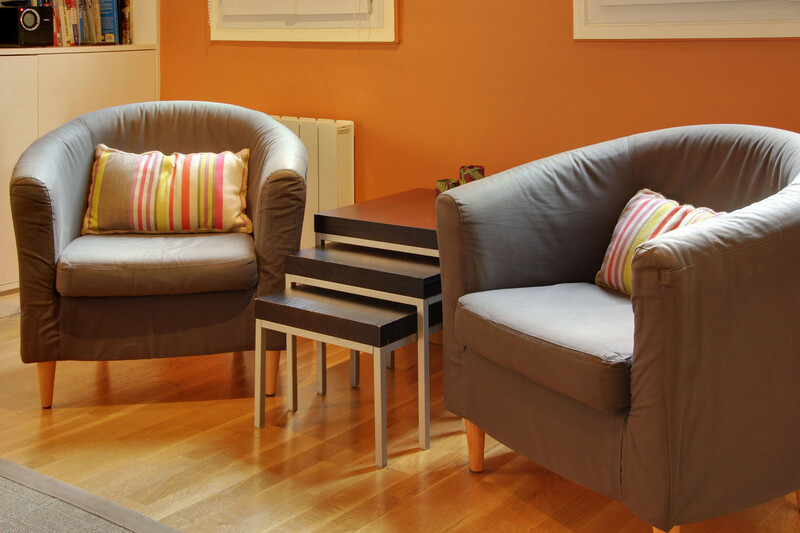 Conveniently located to public transportation, the apartment is just a couple of blocks from metro stops Odeon and Saint-Michel as well as numerous bus routes. Great flat, extremely well placed, comfortable, clean, well equiped and stylish. Our family of 4 stayed at 59 Rue Dauphine early this summer. The studio was just right for the 4 of us. Not a lot of extra space but we were out most of the time. The studio is very intelligently laid out. Our teenage boys slept on the Murphy beds which are large and comfortable. The shower and toilet are separate which makes it more practical. The kitchenette is well equipped and there were a few every day food items such as sugar, tea bags, etc that were useful. The studio has high ceilings and a fan which made it quite comfortable at night. There are windows at both ends for cross ventilation. The only downside could be that it is rather noisy at night because of the cafes on the streets outside. It did not really bother us as we were tired after long days. And the chatter was a happy one! The cable TV sometimes did not work which was a bit of an issue since the Soccer World Cup was on but we managed... Lastly, and most importantly, the location is unbeatable. Almost literally on the steps of the Seine (10 min walk). Amazing cafes, restaurants, eating places of every kind right outside your door. There is a grocery store less than half a block outside. A lovely Italian sandwich store, an open market for fruits and vegetables, a meat shop and so on.. Its a short walk to the metro as well. Since we were so well located we landed up walking a lot more than we had anticipated. So if you are going to buy a metro pass think about it. Ours was totally wasted as we walked a lot more than we thought we would. Notre Dame is walking distance as well. Finally, I want to thank Elodie Fortoul, our Bookings and Reservation Manager for excellent customer service. Always responded to my messages promptly and was there whenever we had any questions... Gail, who showed us around the apartment was also very helpful. If it prices right, we would certainly consider staying at 59 Rue Dauphine again. Hope you enjoy Paris. It was an amazing experience! The place is in the heart of Saint Germain. We arrived on a friday, streets were packed of tourists and although the apartment is in the interior part of the building, noise was evident throughout the weekend until 2 and 3am. We heard people shouting and singing. I was unaware because of my earplugs, but my husband and kids did wake up because of the noise. The place and host was very comfortable for 4 (my 2 teenagers, my husband and me). The host was available all the time via messagges and the reception went along very well in spite our 1 hr delayed flight. I recommend the place for the price and location. This was our first trip to Paris and the location of this apartment was perfect to explore all the major sites. We were close to many eateries too. Michele was always prompt with her responses. The apartment was clean. We stayed here with our two teenage daughters. Would recommend this apartment. Wonderful studio apartment. Perfect for my husband, son, and me. This worked out great for our family of four. Twin murphy beds are great to save space and have enough sleeping space. Kitchen was a nice size and well stocked (even though we didn't cook in it). Perfect location for enjoying all that Paris has to offer. We loved the neighborhood and close proximity to many of the sights. Odeon metro station was convenient. Cozy and comfortable. 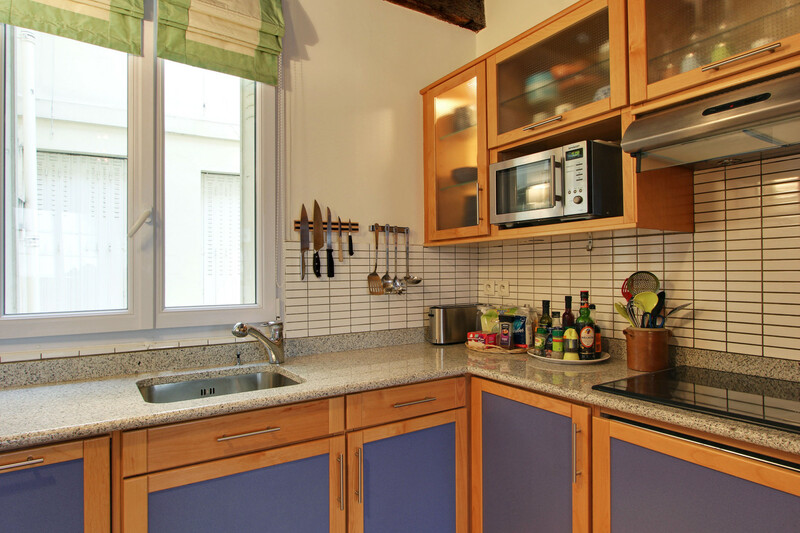 Great and central apartment in the latin quarter! We had a great time there! We stayed at this excellently located apartment with our two children. It was cosy, but workable. Very clean and well-equipped. You couldn't ask for a better location, amidst the best cafes in St Germain. The agent/host provided clear directions and was waiting for us when we arrived. Highly recommended. Staying in the Heart of St. Germain provided a relaxing respite from the pace of Paris. We appreciated the wonderful breezes that flowed through the apartment and the fabulous ceiling fans in the middle of the day when the air was still. The young man who gave us the keys was very helpful, ensuring we knew what all three keys were for and how to use them. When we returned the first evening and couldn't get the apartment door to open, he knew just what information would aid in turning the key just right. We later realized that one key was a much better fit and used that set of keys from then on. 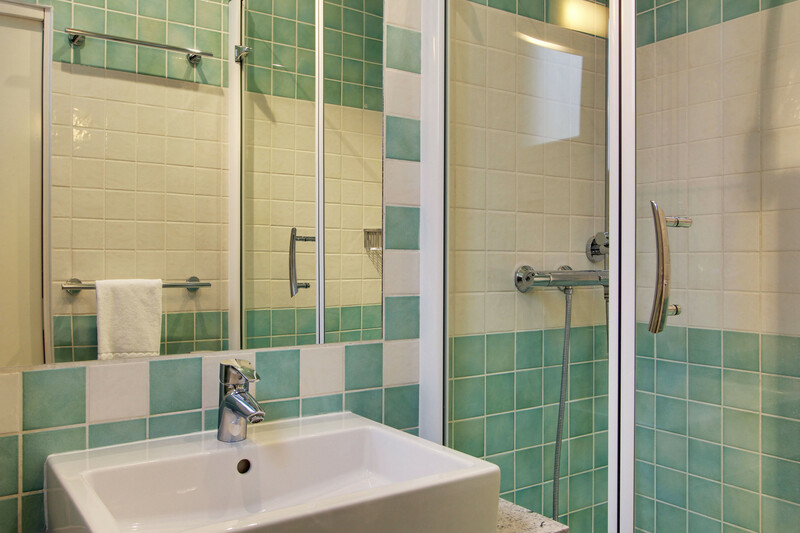 The versatility of chairs and tables in the unit and a fabulous shower also added to the comfort of our stay. We were surprised by the amount of noise at night, given that none of the windows open onto streets and if you have problems tuning out men cheering at a game or singing at full voice, this might not be your perfect fit. Luckily we adjusted fairly quickly. We took full advantage of being so close to Rue de Buci having gelato, buying pastries at Paul's, exploring the fresh produce market. Plus, it was fabulous this trip to be able to walk to Shakespeare and Company, one of our favorite English bookstores in the world. The kitchen is well appointed; the day the toaster shorted out the power, the letting agency was quickly helpful in remedying the problem. We enjoyed our stay in this cozy and clean studio apartment. We were met at the flat by Jaymes who explained how everything worked. Also received a welcome bottle of wine! 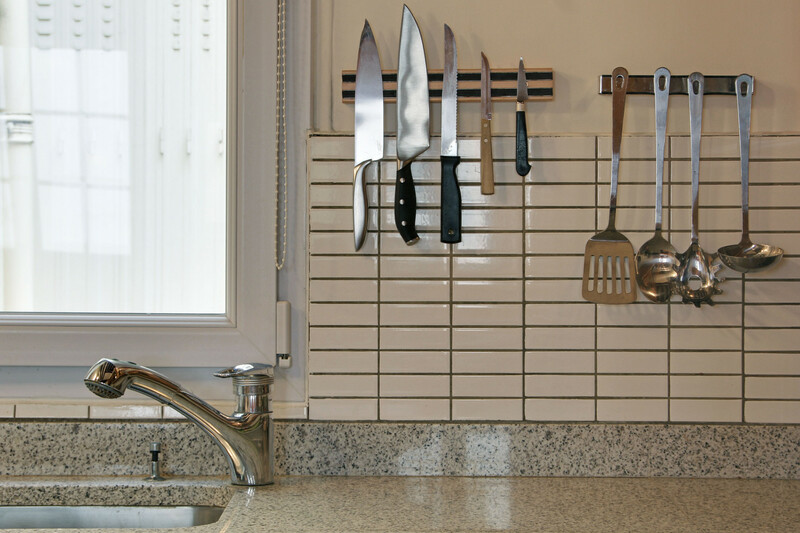 The kitchen is very well- equipped for doing some cooking "at home". Great shower and comfortable murphy bed. WiFi worked well. Very close to Odeon Metro stop and a short walk to the Seine. The only reason I gave it a 4 instead of 5 is it was a bit noisy at night but we would stay there again. The door lock was a challenge as well. We highly recommend getting a Navigo travel card (you need a photo) if you are planning on using public transportation. It more than paid for itself with our ride to Versailles and Roland Garros as well as a few trips on the Metro. We also got the Museum Pass, which was a good value if you plan on visiting several museums and Versailles. I've stayed at this apartment twice now and enjoyed it both times. 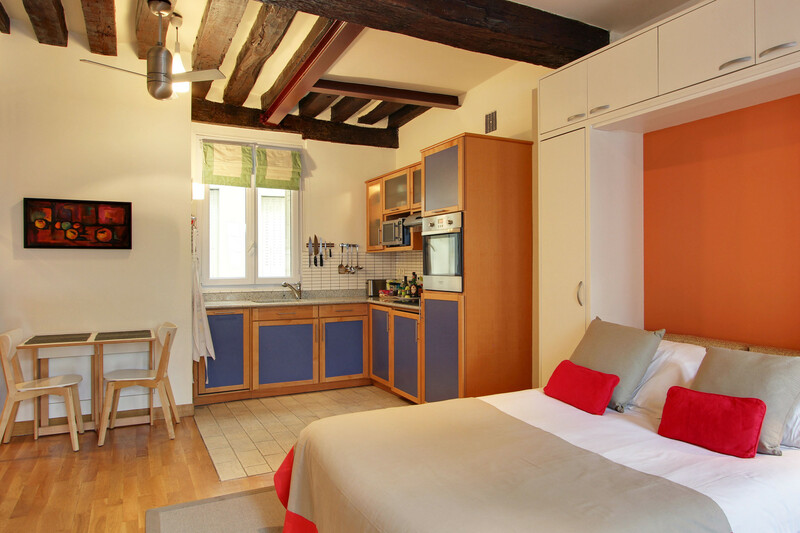 The location is perfect; within easy walking distance of Notte Dame and the Louvre. The adjoining Rue Buci is bustling with restaurants, bakeries and markets. The apartment is quite quiet given the vibrant location. 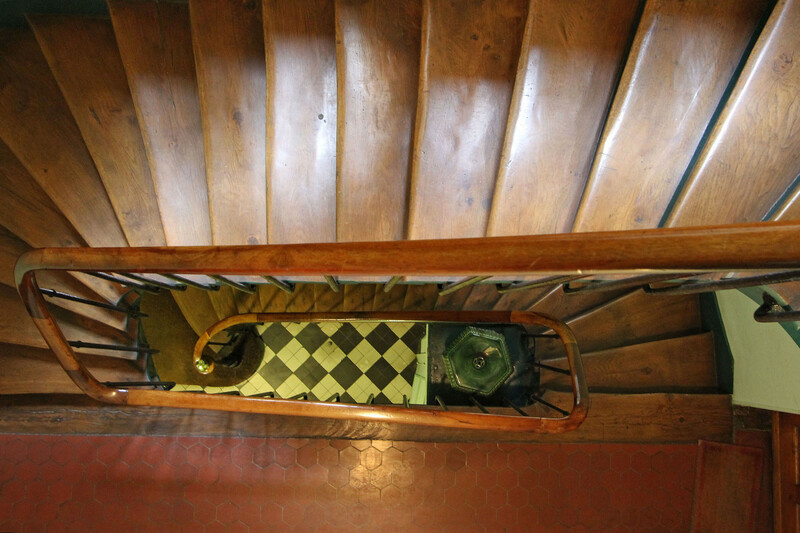 There are three flights of stairs to the apartment. It is well equipped to cook and we appreciated the washing machine/dryer. The apartment was clean. Both times I've stayed at the apartment I've been met at the apartment by a friendly English-speaking greeter who has made sure we were comfortably settled. This is very important when you arrive jet lagged from the USA. Highly recommended. Great spot in the heart of it all! I have been to Paris 5 times now and each time I fall more in love with staying in St. Germain Des Pres. Location - FANTASTIC! This place is in the heart of it all at the corner of Rue Dauphine and Rue De Buci. Everything is near by: grocery store restaurants, bus, metros. It is less than a 10 minute walk to Notre Dame, 15 minute walk to the Louvre. My kids (12 and 11) felt completely comfortable walking everywhere. We even walked to the Eiffel tower from here in just over 30 minutes. Hospitality - Instructions were crystal clear and they do a great job communicating with you. Ben was there to greet us right away. He spent a lot of time going through everything with us. I think almost too much to be honest, but I think it was better then none at all. We were EXHAUSTED when we got there and I think that the 30 minute overview of the apartment could have been cut short. That being said, he was SO friendly and gave us some good tips that we may have never received if he only spent 10 minutes reviewing things with us. Accommodations - Although very tight for a family of four, I felt it was great. The beds were okay (not the best), but they were clean. The only recommendation I would say is that we had a soiled comforter (stains and mascara stains on it) that was not too appealing and we ended up finding another one in the cabinet and switching it out. I hope they just throw that old one away! The amenities were just what you needed: full kitchen, dishwasher, fridge, washer and dryer... Although the dryer doesn't really work so we hung dried our clothes. (not a big deal). Nothing I would really change about the place except maybe a quieter bathroom and shower door.. It seemed to wake up my family every time :) Thanks for the great hospitality and we miss Paris already! I traveled alone so this space was the perfect size for me. During my orientation after arriving we folded up the bunk beds so I could use the work table. It added visual space to the room. The on-site agent, Galenya, was terrific. She was hospitable, experienced, thorough, and open to contact if I needed to reach her. All went smoothly. I visited during the last week of November 2015. The heaters/radiators were functional but it remained cool in the evening. I needed to use the two comforters that were provided. This may reflect more the standard for apartment heating in Paris compared to what I'm used to at home. It's more of an observation than a criticism. One can hear revelry outside on weekend nights but it settles down. When I was there there were two apartments in the building that were under renovation so there was plaster dust and plastic tarps throughout the stairwell and lobby. There was no way I could have stayed in the apartment during the weekdays if I wanted to enjoy quiet. The construction was loud while the workers were considerate. Ask about this when you book. The booking agency was fantastic, onsite welcome fantastic and location fantastic. I arrived in France a week after the awful tragic events on November 13th. While I had no hesitation about visiting Paris and France, I communicated with the agency ahead of time to see if it was appropriate and respectful for me to visit then. I loved the resilience I read in the message exchanges we had and in the way I experienced Paris once more during this trip: beautiful and resolute. Amazing location and a really well set up apartment. Wish I could've spent more time here. Was just disappointing that they were doing renovations on the apartment below this one, as it was quite noisy at times. I definitely recommend this place!! Smooth check-in and check-out. Thank you! "Perfect for a girl's getaway!" Visited for 4 days, and couldn't have been more pleased. The location was PERFECT, the space surprisingly bigger than I anticipated, and the agent was incredibly helpful. Wouldn't change anything about the apartment, and will certainly use this same apartment the next time I find myself in Paris. The location of this apartment could not have been better for our first visit to Paris. Outside our door was a lively area filled with cafes, bakery, grocery store, restaurants, etc. Perfect for those evenings when you don't want to wander far. We were two blocks from the Seine, two blocks from the metro, walking distance to plenty of interesting places. From the apartment, we heard kids playing in the street a few times, just like any neighborhood. We never heard noise or music from local establishments late at night....and we slept with windows open. The apt was fully furnished. The shower was wonderful. The only negative we had was that you can't see down to the street, only over rooftops. There were times we wanted to look out and see if people were wearing jackets or not before we headed down those two flights of stairs with our overwalked, tired feet. Small price to pay for all the pluses that come with this sweet place on Rue Dauphine in the magical City of Paris. It would be hard to get a better location than this flat for a few days' sightseeing in Paris. You can walk everywhere if you feel like it and if you don't, there is a tube station a few minutes' walk away and several buses to take you pretty much anywhere you like. The streets outside are filled with gorgeous food shops and the local markets offer all sorts of delicious foodstuffs. There is even a lovely flower shop should you feel the need to make the flat even more romantic! 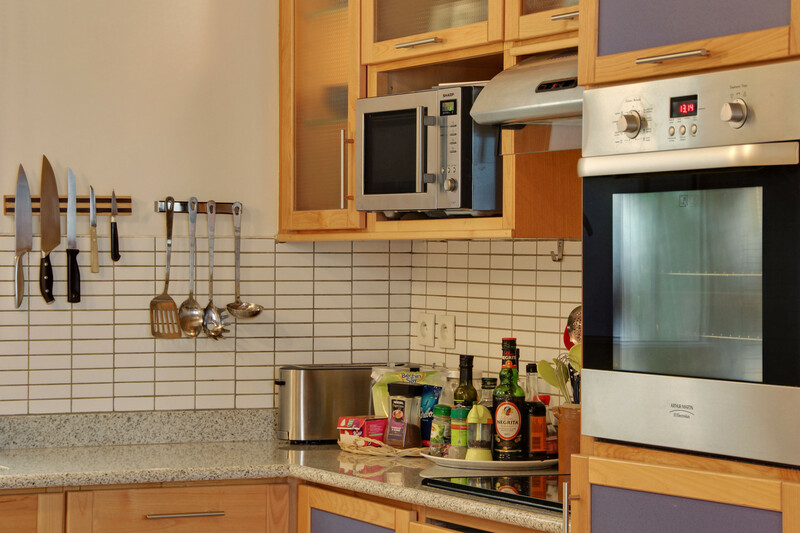 The flat is very clean and the kitchen very well equipped. It's hard think of a better option in such a fabulous location. In the middle of everything on the left bank, this apartment faces inside so you won't be hearing all the busy traffic on rue Dauphine, not even on weekends when its surrounding streets are full of dinners/shoppers. Early in the morning when I go downstairs to fetch bread and coffee I'd see street cleaning and otherwise an open empty scene, very Parisian of time past. We'd be back most certainly and use it more extensively next time, for sure! This was a great flat for our family. The apartment is very nice, clean, and in a great location. The kids loved the murphy beds. The agent who met us after hours (8:15 pm) was very thorough, knowledgeable and patient. He was not rushing to give us the keys and get out the door. As for location, the flat is in the middle of lots of restaurants and a lively area. Most restaurants in the area were also open on Sunday when many places in Paris are closed. It could get noisy with the windows open, but once we closed them we had no problem with noise. We were only there for one weekend, so we basically only did the Eiffel Tower, the Louvre and Notre Dame and some walking around. It was very easy to get to any of these locations. The Louvre and Notre Dame are within walking distance. The Eiffel Tower is about a 40 minute train ride. The metro station is very close - about 5 minutes. We walked to the St Michel/Notre Dame station with our luggage to take the train to the airport. About a 10 minute walk with luggage. It was fine for us - our kids are 10 and 12 years old - so they did not have a hard time taking their own luggage over the cobblestone roads and uneven sidewalks. There were also a few flights of stairs to carry the luggage to get to the train, but we did it with no problems. We would definitely stay in this flat again and highly recommend it! In the heart of Saint Germaine and n Rue Dauphine this apartment provide you walking access to all the great bistros and sights of SG and the Latin Quarter, and some of the best literally outside of your door. To explore further afield requires only a brief walk (5 minutes or less) to one of the 4 nearby metro stations. From there you can get anwhwere you want, both within and beyond Paris, quickly and inexpensively. 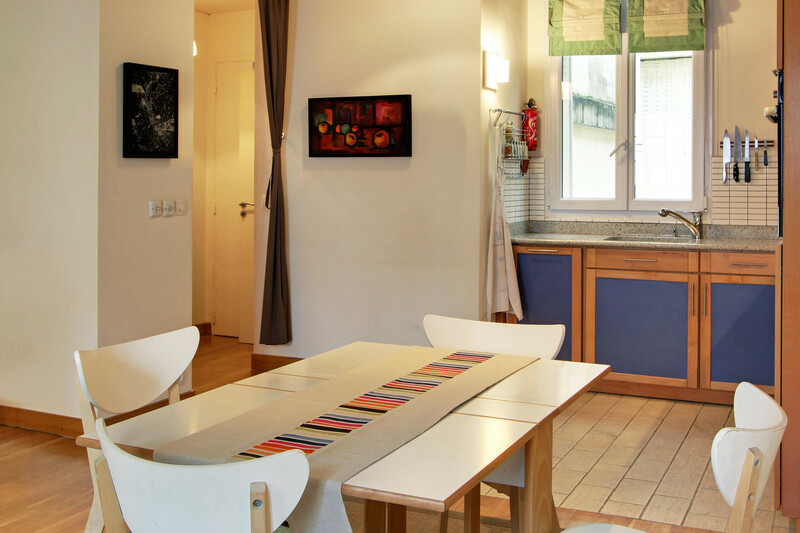 The Dauphine apartment is modern, clean, functional and pleasant. My only criticisim / observation is the lack of a terrace but that will not keep me from renting it again. 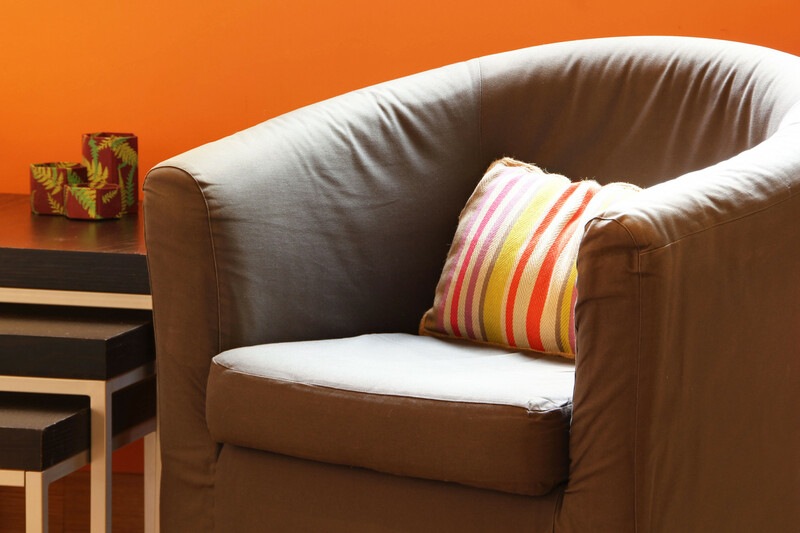 This studio apartment was perfect Parisian! We loved this studio apartment right in the heart of our favorite area on the Left Bank!! It had everything we needed, complete kitchen and all the necessary appliances and Wifi and the beds were wonderful!!! We loved all the winding streets just outside or door, and many bistros, cafes, patisseries, restaurants and shops! It is a very hip old area with all the best of Paris close by!! The agents managing the property were EXCELLENT!! Very professional, quick to respond and to help in everyway to make the trip perfect for us!!! Highly recommend! Pictures and descriptions were exactly representative of the listing!! Lovely!! "Great place for the entire family!" We just returned from a five night stay at the Dauphine apartment. We are a family of four with children ages 7 and 10. The apartment was in the perfect location, close to almost all sites. We walked to most things and used the metro on a few occasions for sights a little further out. There were several cafe's, eateries, and a grocery store steps away from the apartment. In general the apartment was small, but was laid out in such a way that it met our every need. The beds were comfortable with clean linens, the dishwasher and washing machine worked, and the shower was warm. Although we were in the heart of lots of night life, the apartment was quiet when you closed the windows, which made it easy for our kids to fall asleep, or nap at anytime of the day. The agency had returned our deposit within a few days of our departure. I have absolutely no complaints. Great bargain for the price. 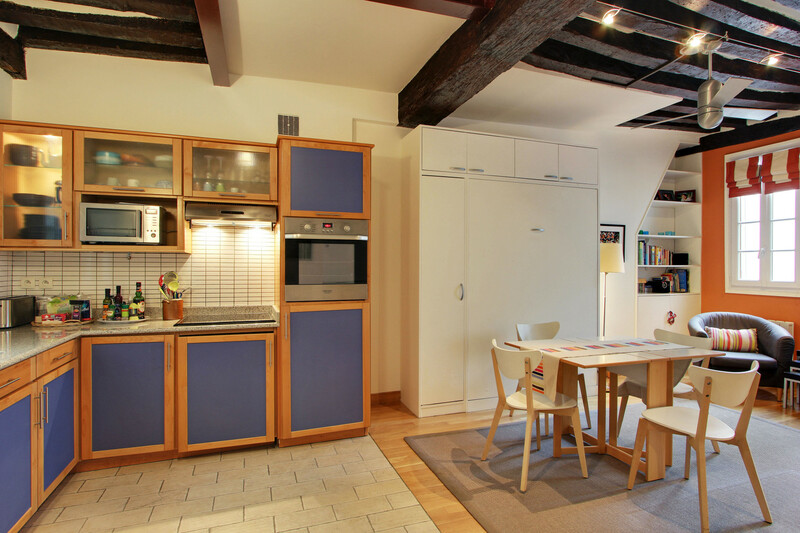 My family enjoyed this studio, which is not only well-equiped but also in the heart of a lively Parisian neighborhood. Our kids especially loved the murphy bunk beds. Excellent appliances and wifi. Ceiling fans were much appreciated during the warm nights we were there. Expect some street noise on weekend nights. Location is prime, close to the Odeon metro stop. 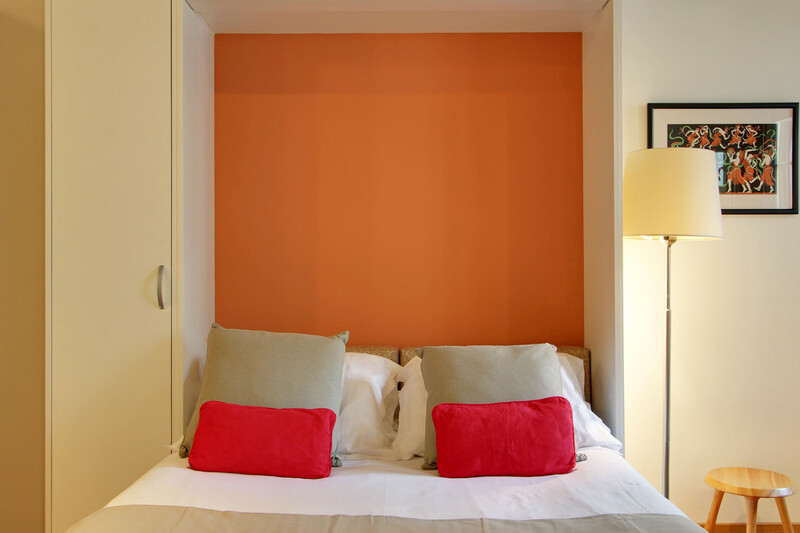 We loved our stay at the studio Rue Dauphine! We were travelling with our teenage sons who are both over 6 feet tall. The murphy bunk beds were perfect for them. Even though the temperature was over 30c, the apartment was cool and comfortable to sleep in. The apartment had everything we needed and the property manager was excellent! We can't say enough about the wonderful area around the studio Rue Dauphine. Lovely cafes, bakeries, grocery stores, etc. A short walk to the Seine, the Jardin du Luxembourg and the metro. We will pass on the name of this apartment to friends and family! The apartment was a great base for our short trip to Paris. Located close enough to the sites that our 5 and 7 year olds could manage walking to them and also not too far from public transport, including the bus stop tright outside. The Odeon area itself was vibrant and, as such, noisy til late some nights but the apartment was equipped to deal with the noise. A creperie two doors down made dinner for the kids and easy choice and if the apartment is available next time we would certainly look to stay again. My wife and I recently stayed in this apartment and we both agreed it was terrific. 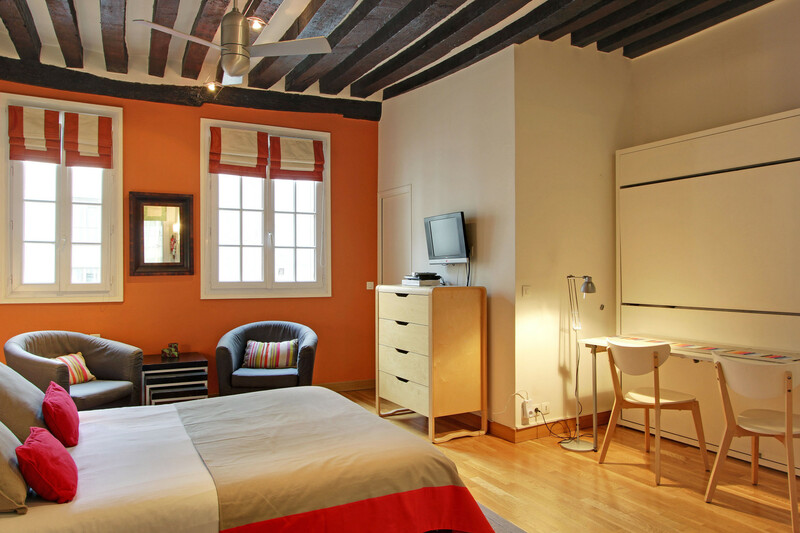 The apartment itself, while often described as compact, is nonetheless two to four times the size of typical hotel rooms in the latin quarter. It was very nice to have the apartment to come back to to eat lunch, take a nap, etc. and not feel cramped as we would have in a hotel. The amenities in the apartment were all more than adequate, with a very nice kitchen area, a bathroom with a stand-up shower that always had plenty of hot water, cable TV and wifi. As we lacked the benefit of a hotel concierge, the laptop I brought was handy for finding answers to our questions (when is this museum open, etc). Our sole problem was a lack of understanding of the washing machine, which was rectified that same day by an HRC representative who got us on our way to clean socks. It should also be noted that the location of this apartment is ideal - the neighborhood is wonderful with ample restaurants, cafes, shops, and even a small supermarket with very reasonable prices. It makes it very easy to stay in for a meal or two to save on expenses. I felt that by being in this neighborhood, we had the benefit of the true Parisian experience, much more than we would have at a hotel. You can walk to numerous attractions and museums from this apartment, though there are also two metro stops nearby. The pictures accurately represent the apartment, so if you think it looks appealing, then I assure you it is. Also, we didn't hear much noise, other than the morning trash or delivery trucks, and found the bed comfortable. 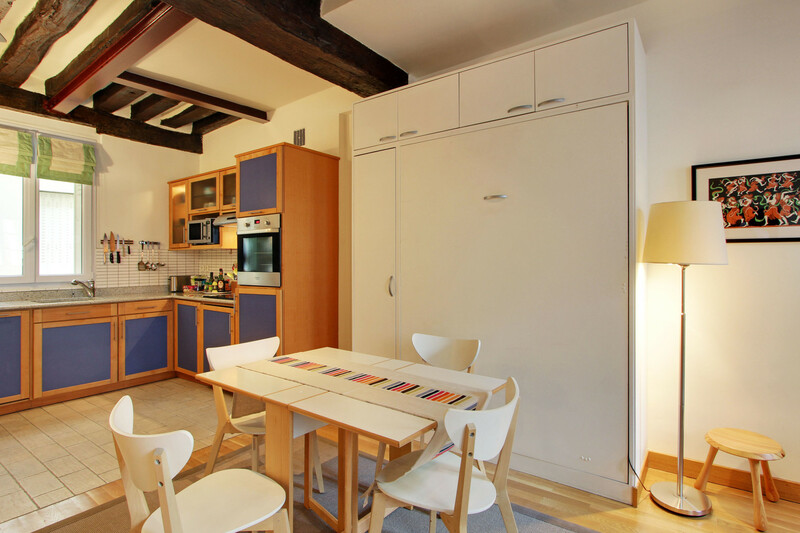 I would recommend the agency, this apartment, and the Rue de Buci neighborhood. In all, we had a truly wonderful experience. Walking distance to many attractions and 5 min walk to 2 Metro stations. Safe, clean, comfortable, spacious well equipped and appointed, couldnt ask for more. 2rd floor appartment located on typical picturesque Paris street / intersection. No traffic noise in appartment, but no views from window. The studio apartment was just right for our family of three (3). My husband Mark, our teenage daughter Gabrielle and myself. The building itself is old of course but we were surprised how the apartment itself is modernized. The kitchen is wonderful. The bathroom shower is big enough for my husband's height... who is 6'1. We wanted to use the washer/dryer combination but it was too confusing so we didn't..oh well. 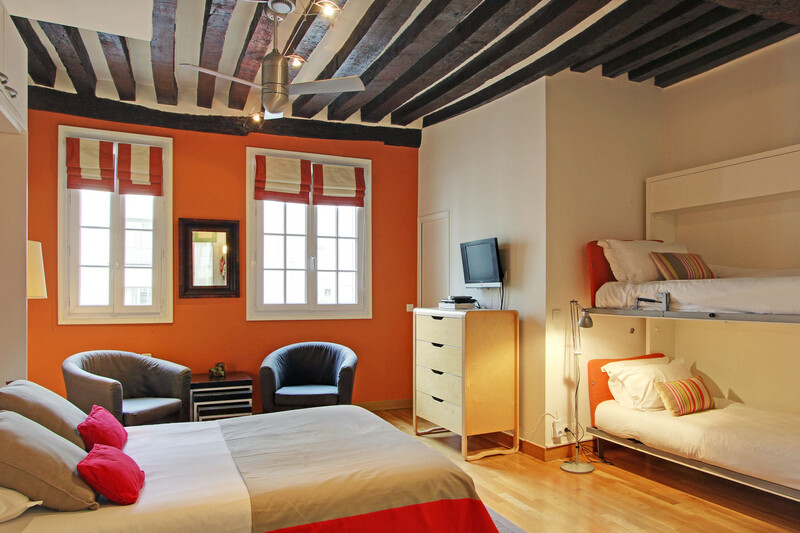 The location is great for the price we paid (very close and walking distance to the River Seine/Notre Dame). There is a wonderful bakery a few steps out of the apartment called Eric Kayser. Bistros/Cafes right outside the apartment. The Metro is also a few steps ahead. What can I say? Left Bank...Great location!!! We truly enjoyed our stay in Paris and we'll be back soon. I would recommend this studio apartment for my friends and family. This apartment and location was perfect for a week stay in Paris. It had everything we needed, easy and very comfortable. Thanks for a wonderful stay. My husband & I loved the place! It was the perfect location in Paris! The convenient bike rack around the corner (as well as the close by Metro stop & so many sites just walking distance away) made transportation so easy. The apartment itself was clean, quiet, & exactly all we needed for our trip. We would highly recommend the apartment to everyone! My wife, 7 year old son and I stayed here for a week. It was the perfect spot for a small family like ours. The apartment was comfortable and well appointed. We loved the neighborhood, the local shops, transportation and easy walking distance to Notre Dame, Louvre, etc. Paris Rental Connections was very easy to deal with and very professional. Looking forward to our next stay. We were spending seven wonderful day in the heart of Paris. The situation is splendid. We could walk by foot and use the metro and had a garage for our car round the corner. Location is superb. Easy walk to the best part of the city with kids 6 & 8. Great cafes, stores, and restaurants nearby. The agent was very helpful, friendly, patient. Our flight's canceled but luckily moving appointment with agent from Sat to Sun was easy. Laundry washer isn't as complicated as we heard. A bit on the noisy side at night due to the lively night life in neighborhood, but not a big problem. Will stay here again for sure. We can heartily recommend this apartment. It met every one of our principle desires: good bathroom/shower, good kitchen area, reasonably quiet, great WiFi, and perfect location. Dining tip: Head one block up to Rue Christine. A nice pasta/pizza place on the corner, and three great French restaurants down this short street. Each one outstanding. We arrived in Paris and were greeted by a local representative of the rental company. She showed us all of the features of the apartment and how everything worked as well as leaving us with a bottle of wine. I have to say as a first time renter of an apartment in a foreign country I was nervous that it wouldn't live up to the advertisement. I have to say Dauphine Studio was absoultely as advertised. It was spacious, airy, bright and extremely comfortable. The kitchen was well set up for anyone who likes to cook. You could not beat the location. It was within very easy walking distance to many of Paris' main attractions (Louvre, Notre Dame etc). As well it was a short walk to the Metro which made the rest of the city accessible. I could not have been happier with a place to stay and know that I will certainly be back to stay hear again hopefully in the near future. Large studio flat right in the heart of the left bank. Close to Ile de la Cite. Just two blocks from the Metro. Well maintained and great for a family of 4. Bakeries and restaurants conveniently located along with a Carrefour. Excellent agents to work with. Would definitely rent this again. This was my first trip to Paris and I was traveling with my mother-in-law and my teenage daughter. The apartment was perfect for us. We walked to most of the sites that we wanted to see and the location was also great for its proximity to the bustling Rue de Buci with cafes, restaurants, and stores. I would definitely stay at the Dauphine again next time I travel to Paris. We traveled with our two children, ages 9 and 6. This apartment was great and bigger than I expected. It was larger than a hotel room and very comfortable. Our kids loved the bunk beds and it was a very efficient use of space. They had good wifi access and the agent was very friendly and helpful when we arrived. She gave us all the required info. upon arrival and helped set up our laptops. The location couldn't be better. It's in the heart of the 6th arron. and we walked everywhere. There is a supermarket two minutes away and plenty of restaurants and pastry shops all around the area. The apartment itself is on the second floor (no lift) and is very clean. Bedding was good, heating was good, everything nicely stocked. They have plenty of dishwashing tabs, toilet paper, laundry tabs and a hairdryer and cd player. There are only two things that we didn't care for. First, if you are expecting an american style washer/dryer, be aware. There is a small washing machine in the kitchen but the steam dry function just was confusing and didn't do it for us. We tried washing one load and had to hang dry our clothes which was a pain. So unless you are used to this setup, make sure you pack enough clothes. Second, the bathroom/toilet is separate from the shower. 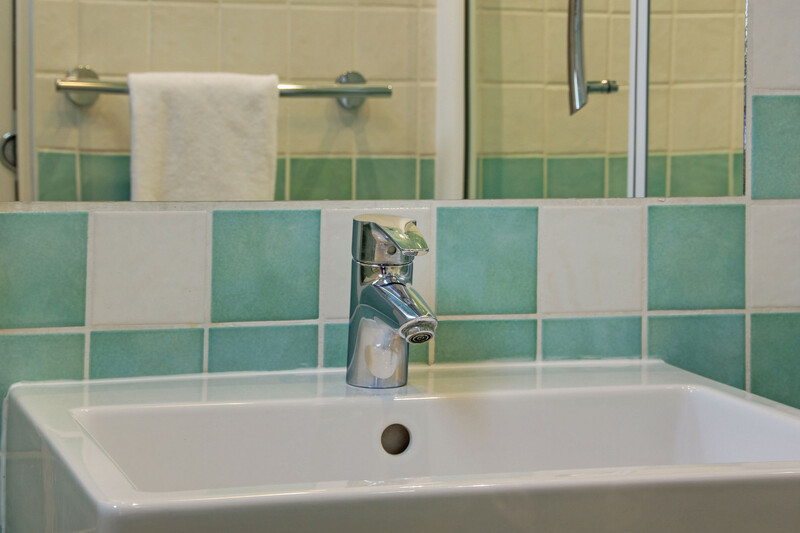 The shower/sink are fantastic but we wish the toilet could have been next to the shower. They are on opposite ends of the room. Again, we just weren't used to this and didn't like that configuration because there is no sink next to the toilet. All the other amenities are great and just like the pictures. This is a great value and very comfortable for a family of 4. It was also quiet and we did not hear street noise at night. Michele and Elodie at Paris Rentals were very responsive/professional and answered all my questions leading up to stay. Our studio apartment was just perfect. Plenty of room for the three of us storage wise and room wise. Location could not have been better with shops, restaurants, banks, grocery store, etc. right outside our door and yet could hear no noise in the apartment. We felt safe both day and night in this lovely area and it was very convenient taking buses, trains or walking to other areas. Could not have chosen a better location. Would stay here again. Perfect vacation, could not have picked a better place! Right in the heart of the Latin Quarter, incredibly close to metro and RER stops, as well as the Seine, Notre Dame, and other sight seeing locations. The apartment itself is adorable, includes all the amenities you could need, and manages to keep out the noise while being in a fun spot. I recommend to all. My husband and I stayed here for 5 nights in September 2012. We took the train from the airport and walked from the closest train station. The agent met us in the apartment. She was very nice. She helped with figuring out the appliances, internet, TV and so forth. She gave us some recommendations on where to eat. We were within walking distance of many of the museums. If we couldn't walk, we took the train. This is a very busy area and the street was noisy until after midnight, but tapered off that. Lots of little cafe's, restaurants, bars. We didn't really cook because there were so many choices of great food right outside our door! We loved the studio apartment. The location was fabulous! We were able to walk practically everywhere we wanted to go. Wonderful restaurants in area and great shops. Bakery and fruit stand right around the corner. The apartment was perfectly accommodated. I would definitely stay here again. My wife and I stayed at this location for the second time in 2 years. It is a very clean and cozy place to stay. The location can not be beat. You can pretty much walk to all of the great spots in Paris. Metro is a quick 5 minute walk away. I would highly recommend this spot to anyone looking to stay in Paris. This was our first trip to Paris and we will certainly return. When we do we will choose to stay in the Dauphine Studio. Exactly as the pictures. The location was fantastic! We especially enjoyed the short walk (5 min) to the Seine. With two children (8, 10) this area was perfect for us. We could walk almost everywhere we wanted to go. (Lourve/NotreDame/Musee De Orsay) I would recommend taking the train to the Eiffel Tower (although we did walk) Odeon Metro stop is just 5-7 minutes walk from the apartment. We enjoyed having the fully functional kitchen in the apt and ate breakfast and dinners at home. Carrefour and Picard were conveniently located. We ordered a car that was recommended by the rental company and he was efficient at picking us up and getting us to the apt. We also used him to take us to the airport. We were met at the apartment by the agent (Shelley) who personally walked us through the apt and key exchange. Staying in this old Parisian flat was such a good choice for us! I have not enjoyed staying anywhere in Paris as much as this apartment. 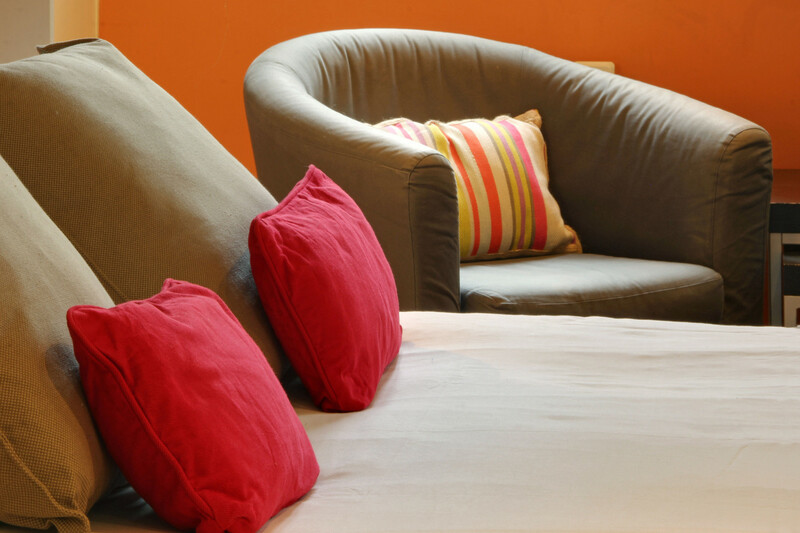 Location, comfort, friendliness - parfait! Thanks so much - hope you will let us come and stay again. After searching long and hard for accommodations for our 5-night stay in Paris in July, we settled on the Dauphine and it met all our expectations. Having an apartment with a fridge, cooking facilities, and a washer/dryer was great as our visit to Paris came at the end of a two week stay in France. The apartment is fully stocked, nice and clean, the management kept in great communication throughout the process, we were met in the apartment by staff on our 1st day who explained everything thoroughly, and we simply did not have a single problem or issue during our stay. The best part, however, is the location. For the average tourist like us, you're right in the middle of everything...we walked to the Notre Dame, St Chapelle, Concierge, St Sulpice, Luxembourg Gardens, Louvre, Orsay, and L'Orangerie, Marais, etc. The Odeon metro is real close, which we took to the sites further out. And there are a ton of restaurants, shops, bakeries, and grocery stores within minutes of the front door. We were very impressed with the location of this unit. We absolutely loved it. Unit is small but comfortable. Kitchen is very very well equipped. A bit noisy from both upper apartment. And outside. Bathroom is a bit awkward but not a major inconvenience. We would absolutely stay here again and recommend d to family and friends.